Who’s in charge of holiness (k’dusha) in the world? G-d or people? In this week’s reading, we are introduced to the Shmita, the sabbatical year. The Torah Sabbatical year is not about crop rotation. It’s about the land having its own Shabbat: “ve’shavta ha’aretz”, says the text (Leviticus 25:2), and the land will rest. The land in this verse is the subject. It is not acted on by anyone. It is in itself the one doing the resting. The Yismach Moshe (1759-1841) calculates that within a 6 year period, there are about 300 shabbat’s (shabbatot, in correct Hebrew). 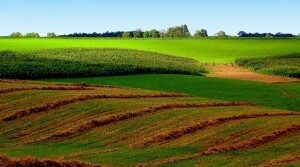 During this time, the land grows crops and fruits. Therefore, we need one shmita year when the land can rest – for about 300 days, besides its own Shabbat days, to make up for those 6 years. However, during 7 years of shmita (in a cycle of 7X7), the land also grows “stuff”, about the same days as one year (50 shabbat days in a shmita year, and 7 shmita years in a cycle), then comes the Yovel – Jubilee – to correct that. There is one other place, where the text says – “Shabbat for G-d”, like here, and that is at creation. Thus explains the Meshech Chochma (1843-1926): the holiness of Shabbat is different from the holiness of the holidays. The first – is divine and independent of anything people do. The second, depends on messengers seeing the moon and sages establishing a calendar, which at times can be adjusted to come a day earlier or a day later. Similarly, the Jubilee in the Land of Israel depends on the majority people being on the land and observing it. This is based on the verse: “and you shall sanctify it” (25:12), namely – you, and no one else. But shmita is like Shabbat. Further, within the cycle of shmita, one has to give a special tithing on the 3rd and 6th year, parallel to the 3rd and 6th day of creation, which are considered “twice good”. Today, I see in it this lesson: Holiness is both divine or created by people. We can do it. But we can’t do it all by ourselves. It’s simple, but it offers a balance I like: I can make a difference. I can be a part of. I like that it’s not on my shoulders, and that Someone much greater is here too.